CUSHIONS There is 1 product. 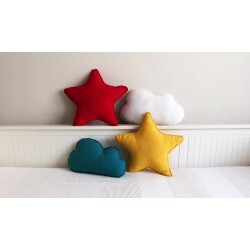 Star-shaped and cloud-shaped cushions to wish the little ones sweet dreams. Yellow and fuchsia star-shaped cushions and deep turquoise and white cloud-shaped cushions. Star Shape: 45cm x 45cm / 36,50 € Cloud Shape: 45cm x 26cm / 30,35 € * You can customize it with the name that you want by order via e-mail with a supplement of 3,50 € more.